While Linnworks subscribers are familiar with the use of eBay to sell a wide range of items, commercial forces generally limit the amount people can spend on individual items, and sellers are limited as to how much they want to spend on stock, especially per item. Obviously for individual and unique items, individuals can ask for, and receive some pretty impressive prices. Have you considered just how much some people have spent in one go on eBay? Most things celebrity tend to bring in big revenues, with things like Scarlett Johansson’s used tissue making $5,300 and Britney Spears’ Used Chewing Gum making $14,000. But these are small figures compared to some of the most expensive items ever sold on eBay. Get your credit card ready, you’re going to need it if you want to pick up any of these items. In 2007, it was confirmed you really can buy anything on eBay, when a Texan ghost town was put up for sale. An insurance broker originally bought the town of Albert, for $216,000 and invested almost half a million dollars in renovations, before putting the town up for auction. 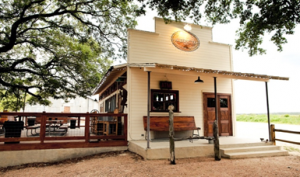 The winner of the bid transformed the town, playing with the Wild West feel of the place, by turning the local convenience store into a Western saloon which the locals now call the Albert Ice House. The town is now more of a tourist attraction than a place to live and makes for an unusual yet quaint wedding venue. This next item comes not only with a huge price tag but a fascinating story as well. You might find this story uncomfortably familiar. You’ve been with your partner a while and then for one reason or another, the whole thing falls apart. You’re left with constant reminders of them no matter where you turn; items you bought together, clothes they’ve left behind, memories you share. Well a man called Ian Usher went through pretty much the same thing but took getting over his ex-wife to the extreme. In 2008, Usher’s wife left him and he decided he needed a fresh start. So what did he do? Put a few of her belongings left behind at his place up for sale on eBay to make a bit of extra cash? No, he put his entire life up for sale. His life sold for just under £192,000, a little disappointing considering the auction included his house with everything in it, his car, his jet ski, his parachuting equipment, his job and a meet and greet with his friends. Since selling his life on eBay, Usher is now happy again. He’s travelled the world, swam with whales, ridden a motorbike on a wall of death, met Richard Branson and most important of all, once again found love. His journey sounds like something out of a film and soon that’s very well what it could be as reportedly, Disney have bought the rights to Usher’s story. Rule number one when selling on eBay is to ensure that your item is as searchable as possible. This includes using key words and most importantly ensuring you have spelt every word correctly, for example a brand name of “Allsop’s” instead of “Allsopp’s”. You can pick up a bargain if someone fails that basic rule of online selling, and that’s exactly what happened to one lucky buyer. Up for sale was a bottle of ale but not just any ale. This ale came with a history. 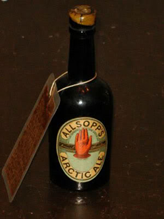 It was brewed especially for Sir Edward Belcher’s 1852 Artic Expedition and was kept in excellent condition. Not that the buyers would be able to see that though, as the seller only posted three pictures of this extremely rare item. The lucky bidder must have had a keen eye and picked up the ale at a steal, paying just $304. Hopefully that’s the last the seller heard of the item, as he’d be having a bit of nightmare once he heard how much money he could have got. The item, (this time spelt correctly), sold for a whopping $503,300 making a huge $502,996 profit for the original buyer, and teaching us all the benefits of correct spelling when selling online. In 1962, in Zagami, Katsina Province in Nigeria, a meteorite fell to Earth. This meteorite wasn’t just an ordinary chunk of rock that fell off the back of a comet or asteroid, though. This piece of rock had come from Mars. There are just 120 Martian meteorites on Earth meaning anyone lucky enough to get their hands on a piece is talking serious money. In 2006, an owner of a piece of this rare Martian geology decided to try and sell it on eBay. It hadn’t even been bought, before planetariums and space museums were pleading with buyers to consider allowing the meteorite to be available for loan. At the time, the item was considered to be one of the most valuable space rocks on the planet, so valuable in fact, that the valuation of these meteorites is similar to that used for diamonds. The item did not go to a planetarium but it did go to a buyer willing to pay the huge sum of $450,000. The winner of the most expensive item ever bought on eBay is the Giga Yacht. The auction ended at $85,000,000 but that was just the deposit. 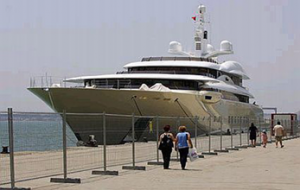 The total cost of the luxury boat was a whopping $168,000,000 and went to Russian billionaire Roman Abramovich, to go in his portfolio alongside Chelsea FC. For this price, the yacht included a salon, a cinema room, a gym, an office, a retractable lift for boarding, a helicopter garage and a swimming pool . And when you’re at the latest beautiful port or beach, you have panoramic windows to enjoy the full view of the scenery. The yacht also includes eight guest cabins for Abramovich to invite all of his closest friends on board, or even the Chelsea football team.